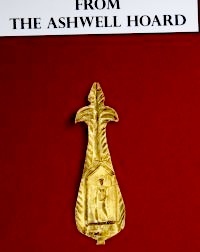 On 26 April 2007, Dr Ralph Jackson, representing the British Museum, presented a replica gold votive plaque from the Ashwell Hoard to the Ashwell Village Museum. To celebrate this rare event, The Trustees and Friends of Ashwell Village Museum held an Open Evening in the Parish Rooms and the museum. Everyone with connection to the Hoard and its related archaeology was invited along with a fair portion of villagers – spurred on no doubt by the prospect of wine and nibbles based on Roman recipes. Over 100 people crammed into the Parish Rooms to see the event. Peter Greener, Curator of the Ashwell Village Museum, introduced the evening by welcoming everybody and saying how pleasing it was to have representatives of all the major parties involved in the discovery. The Metal Detectorists and the Archaeologists had worked in harmony throughout. 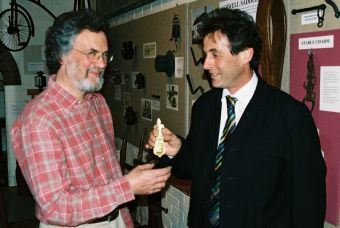 Alan Meeks, the finder, was present with other members of the North Herts Charity Detector Group who, on that day in November 2002, having located the hoard had the presence of mind to call in the archaeologists straight away. It is amazing how it had remained unfound and almost intact for so many years when it was just below the surface. Gil Burleigh, who was also at the open evening, arrived at the site within an hour to work alongside the detectorists. Gil has been connected with the project ever since, directing and organising the fieldwork including four digs and the associated post-excavation work with the enthusiastic help of the NHAS, many volunteers and some financial help from the British Museum. It has been interesting to see how the theories about Senuna’s Shrine and the rituals that took place there have changed each year with the discovery of new evidence. Dr Jackson, Curator of Romano-British antiquities at the British Museum gave an introduction to the Hoard, its international significance and the way that painstaking conservation and detailed detective work had slowly revealed more and more about Senuna, the hitherto unknown goddess, and her devotees. Mike Neilson, the replica maker, told us, with many amusing anecdotes, about his work at the British Museum. The plaque replica was made by moulding and electro-plating. You know it is ‘right’ when the two are alongside each other and you can’t tell which is the original. Peter Greener then said how thrilled the people of Ashwell were to have a little bit of the Hoard returned to them. The Ashwell Museum plaque is leaf-shaped and has a dedication from Cariatia Ressa. The replica has fleshed out the bones of history much more than any photographic reproduction could do. We can now understand how much these people, who we know by name, thought of their goddess. They were prepared to come all the way to the shrine and spend considerable sums on having such beautiful objects made to the glory of Senuna. You can now see the plaque in Ashwell Village Museum. A new permanent display highlights the replica. There is also an in depth view of the Hoard with many photographs supplied by the British Museum taken during the conservation work. The discoveries of the archaeological digs at the find site have been illustrated with the help of Gil Burleigh.